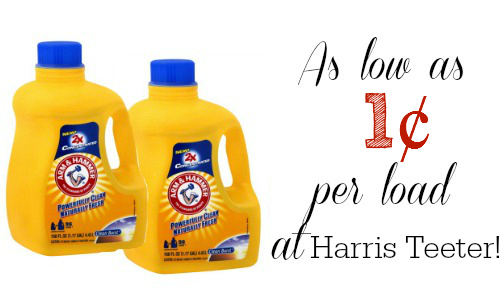 Home > Harris Teeter > Harris Teeter Deal: Arm & Hammer Laundry Detergent, 47¢! Harris Teeter Deal: Arm & Hammer Laundry Detergent, 47¢! Alright guys, get those dirty clothes ready! You can use an Arm & Hammer Laundry Detergent coupon to get it for 1¢ per load! This is a really awesome sale, so great ready to shop! Arm & Hammer Detergent is the e-Vic item this week at Harris Teeter. If you buy more than 2, they are $4.99 each. Don’t have a Harris Teeter? It’s also on sale at other stores!